CAST OF OVER 30,000 INCLUDES MANY SCREEN AND STAGE NOTABLES. 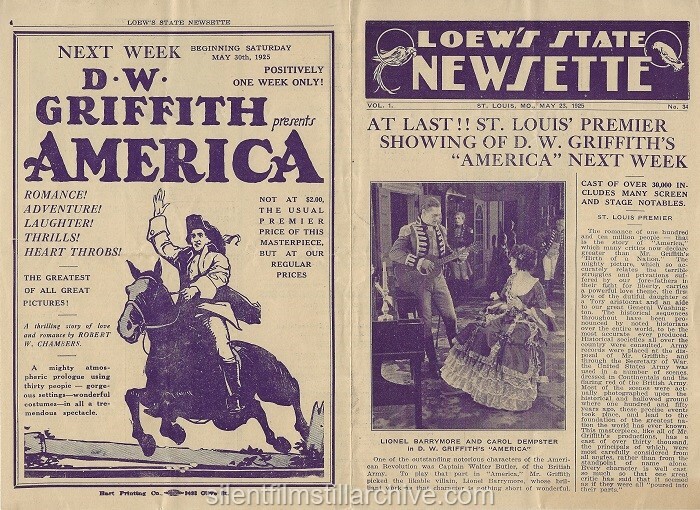 The romance of one hundred and ten million people - that is the story of "America," which many critics now declare greater than Mr. Griffith's "Birth of a Nation." The mighty picture, which so accurately relates the terrible struggles and privations suffered by our fore-father in their fight for liberty, carries a powerful love theme, the first love of the dutiful daughter of a tory aristocrat and an aide to our great General Washington. The historical sequences throughout have been pronounced by noted historians over the entire world, to be the most accurate ever produced. Historical societies all over the country were consulted. Army records were placed at the disposal of Mr. Griffith; and throught the Secretary of War, the United States Army was used in a number of scenes, dressed in Continentals and the flaring red of the British Army. Most of the scenes were actually photographed upon the historical and hallowed ground where one hundred and fifty years ago, these precise events took place, and lead to the foundation of the greatest nation the world has ever known. This masterpiece, like all of Mr. Griffith's productions, has a cast of over thirty thousand, the principals of which, were most carefully considered from all angles, rather than from the standpoint of name alone. Every character is well cast so much so that one great critic has said that it seemed as if they were all "poured into their parts." LIONEL BARRYMORE AND CAROL DEMPSTER in D. W. GRIFFITH'S "AMERICA"
One of the outstanding notorious characters of the American Revolution was Captain Walter Butler of the British Army. To play that part in "America," Mr. Griffith picked the likable villain, Lionel Barrymore, whose brilliant work as that character is nothing short of wonderful. THE GREATEST OF ALL GREAT PICTURES! A thrilling story of love and romance by ROBERT W. CHAMBERS. A mighty atmospheric prologue using thirty people - gorgeous settings - wonderful costumes - in all a tremendous spectacle. Hart Printing Co., 3433 Olive St. Operated in conjunction with the vast chain of Loew's Theatres extending from coast to coast. E. A. Schiller -- Gen. Rep.
Louis K. Sidney -- Div. Mgr. Harry Greenman -- Managing Dir. Adolph Buehrig, Jr. -- House Mgr. John J. Baker -- Asst. Mgr. Harold B. Drygert -- Pub. Dir. Dr. W. M. Hangen -- House Phys. Floral Decorations by the Acme Flower Shop, Arcade Bldg. Ladies' parlor is on the Mezzanine floor to the right on entering. Gentlemen's Smoking Room Mezzanine floor to the left on entering. Telephone in both Ladies' parlor and Gentlemen's Smoking Room. Check Room on Mezzanine door to left on entering. Our check-rooms are free if you care to check your wraps, umbrellas, bundles, etc. The check-room ladies are forbidden to accept charges for this service. Continuous Performances start at 11 A. M. daily. Full presentations with orchestra, soloists and scenic effects begin at 1:30, 3:30, 7:00 and 9:00 o'clock. Alice Terry, now playing opposite Lewis Stone in "Confessions of a Queen," adapted from Alphonse Daudet's story, "Kings in Exile," recently overheard this one. "Did Liza jane git a good man," queried the cook, "when she ma'ied down in Memphis?" "Sho' did!" Replied the maid. "Ma'ied him right outen de jail house. He didn't have no time t' git in no trouble." 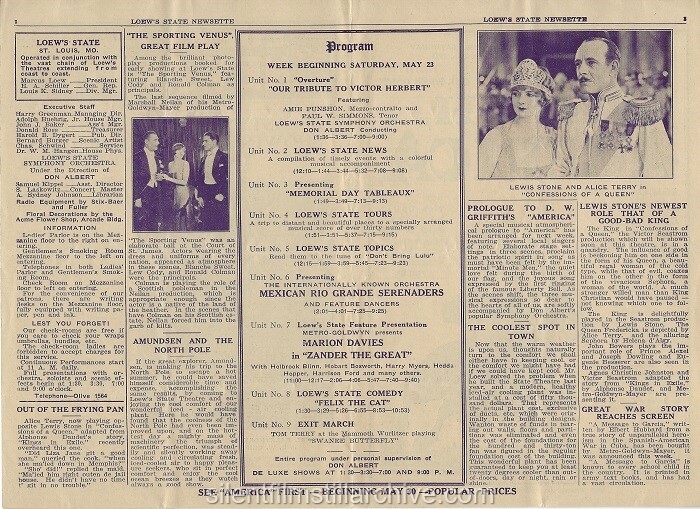 Among the brilliant photoplay productions booked for early showing at Loew's State is "The Sporting Venus" featuring Blanche Sweet, Lew Cody and Ronald Colman as principals. The last sequence filmed by Marshall Neilan of his Metro-Goldwyn-Mayer production of "The Sporting Venus" was an elaborate ball at the Court of St. James. Actors wearing the dress and uniforms of every nation, appeared as atmosphere in these scenes. Blanche Sweet, Lew Cody and Roland Colman were the principals. Colman is playing the role of a Scottish nobleman in the Neilan production, which is appropriate enough since the actor is a native of the land of the heather. In the scenes that have Colman on his Scottish estate, Neilan forces him into the garb of kilts. If the great explorer, Amundsen is making his trip to the North Pole to escape a hot summer, he could have saved himself considerable time and expense, accomplishing the same results, by coming to Loew's State Theatre and enjoying the cool comfort of our wonderful ices-air cooling plant. Here he would have found that the coolness of the North Pole had even been improved upon, and on the hottest day a mighty mass of machinery the triumph of scientific perfection, was steadily and silently working away cooling and circulating fresh, iced-cooled air to happy pleasure seekers, who sit in perfect comfort and enjoy the cool ocean breezes as they watch always a good show. "OUR TRIBUTE TO VICTOR HERBERT"
Read them to the tune of "Don't Bring Lulu"
MARION DAVIES in "ZANDER THE GREAT"
with Holbrook Blinn, Hobart Bosworth, Harry Myers, Hedda Hopper, Harrison Ford and many others. TOM TERRY at the Mammoth Wurlitzer playing "SWANEE BUTTERFLY"
DE LUXE SHOWS AT 1:30 - 3:30 - 7:00 and 9:00 P.M.
LEWIS STONE AND ALICE TERRY IN "CONFESSIONS OF A QUEEN"
PROLOGUE TO D. W. GRIFFITH'S "AMERICA"
A special musical atmospherical prologue to "America" has been arranged for next week featuring several local singers of note. Elaborate stage setting in three scenes, proclaim the patriotic spirit in song as must have been felt by the immortal "Minute Men," the quiet love felt during the birth of our flag, and the joyous song expressed by the first ringing of the famous Liberty Bell. As the scenes shift, the three musical expressions so dear to the hearts of all of us, are softly accompanied by Don Albert's popular Symphony Orchestra. now that the warm weather is upon us, thoughts naturally turn to the comfort we shall either have in keeping cool, or the comfort we might have had if we could have kept cool. Mr. Loew solved the problem when he built the State Theatre last year, and a modern, health iced-air cooling plant was installed at a cost of fifty thousand dollars. That represent the actual plant cost, exclusive of ducts, etc. which were originally in the building designs. Wanton waste of funds in tearing out walls, floors and partitions was eliminated and even the cost of the foundations for the hundred and thirty-ton fan was figured in the regular foundation cost of the building. This wonderful plant has been guaranteed to keep you at least twenty degrees cooler than out-of-doors, day or night, rain or shine. The King in "Confessions of a Queen," the Victor Seastrom production which will be shown soon at this theatre, is in a quandry (sic). The influence of good is beckoning him on one side in the form of his Queen, a beautiful regal woman of the cold type, while that of evil, coaxes him on the other in the form of the vivacious Sephora, s woman of the world. A much stringer willed man that King Christian would have paused – not knowing which one to follow. The King is delightfully played in the Seastrom production by Lewis Stone. The Queen Fredericks is depicted by Alice Terry, and the alluring Sephora by Helena d'Algy. John Bowers plays the important role of Price Alexet and joseph Dowling and Eugenie Besserer are also seen in the production. "A Message to Garcia," written by Elbert Hubbart from a true story of unparalleled heroism in the Spanish-American War in Cuba, has been bought by Metro-Goldwyn-Mayer, it was announced this week. "A Message to Garcia" is known to every school child in the country. It is printed in army text books and has had a vast circulation. Photo from CONFESSIONS OF A QUEEN (1925).